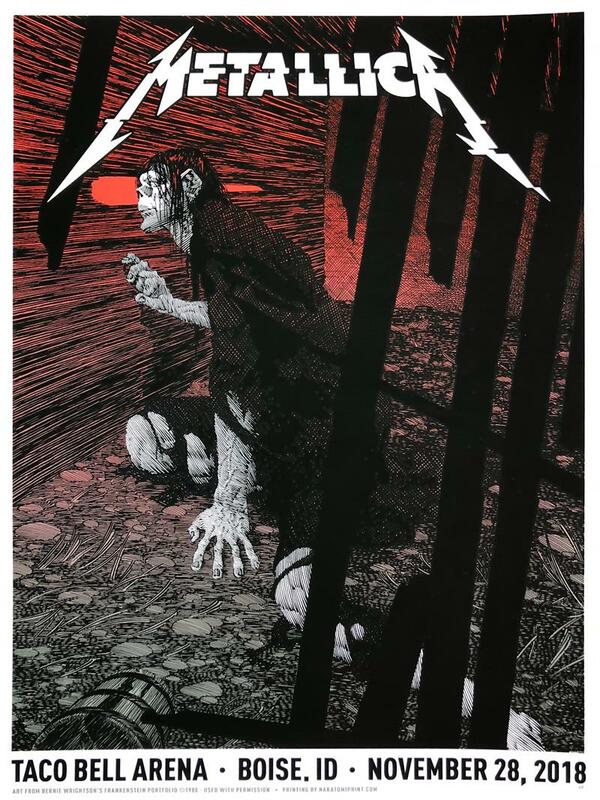 METALLICA- 11/28 Boise print by Bernie Wrightson! Metallica VIP Poster by Bernie Wrightson! Produced in conjunction with the Wrightson estate, this 18×24 hand-printed silk-screen poster features a reproduction of one of Bernie’s classic Frankenstein images, with color treatment by the Nakatomi staff. Hand-marked llimited AP edition. Photo above is of the ACTUAL print! The prints available at the venue last night were off-set litho prints, and these AP copies we’re selling on Nakatomi are the ONLY silkscreen copies of this print available. Print is in hand and ready for immediate shipment– will be in delivered in time for holiday gift-giving! Big thanks to Liz Wrightson for helping us keep Bernie’s work in print, and in front of fans worldwide. ← Metallica 11/26 Las Vegas by Ian Bederman!